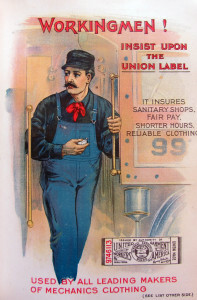 Union advertisement; Brotherhood of Locomotive firemen’s magazine; January 1887; Tamiment Library/Robert F. Wagner Labor Archives, New York University. The Gilded Age in America (approximately 1870-1900) was a time of great growth for organized labor. With this growth came the publication of union newspapers and magazines, and with the publications came poetry. Union magazines offered a sort of portable communal meeting place for workers spread out across the country and the world. They were often published monthly, listing local union’s contact and meeting information, ads for union goods, editorials on labor and politics, advice columns, and humorous anecdotes. Title Page; Brotherhood of Locomotive firemen’s magazine; January 1887; Tamiment Library/Robert F. Wagner Labor Archives, New York University. This volume of the Locomotive Firemen’s Magazine held at the Tamiment represents a height of union involvement and poetry during the Gilded Age. Published in 1887, this volume contains several months’ worth of magazines with social issue articles, union information, calls to action, a women’s section reserved for wives of Locomotive Firemen “brothers”, and social pages. “My Dinner Pail”; Brotherhood of Locomotive firemen’s magazine; January 1887; Tamiment Library/Robert F. Wagner Labor Archives, New York University. This five stanza poem, “My Dinner Pail”, is a typical entry in the Locomotive Firemen’s Magazine. Its subject is highly relatable and almost commonplace, and the style follows popular rhyme schemes and conventions. In addition, it brings the union work home, always tying the labor life and fight to members’ families. Another poem entitled “Herbert P. Littlejohn” uses strong labor imagery and the themes of hardship and duty to reach the reader, who likely saw harsh conditions of the work they did everyday. The rhyming quatrains make poems like this one easy to turn into song-poems, sung to a popular tune should the occasion arise in a protest or local meeting. Where some poems were universally applicable to union members and generally rousing and patriotic, others were intensely personal. Halker points out that, though some poems published were written by writers we still know today, editors rarely actually turned down submissions. “Lines on the marriage…”; Brotherhood of Locomotive firemen’s magazine; January 1887; Tamiment Library/Robert F. Wagner Labor Archives, New York University. 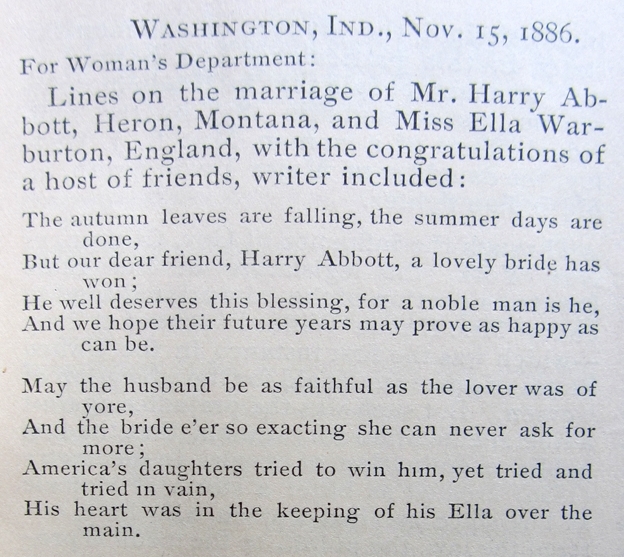 The wives of union members were heavily involved in the Magazine. This poem is a note of congratulation to a new union couple. 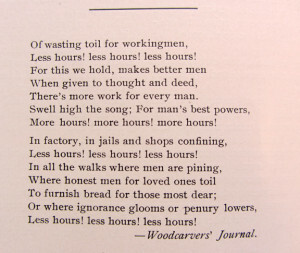 The inclusion of poems like this one highlight the very personal nature of unions and the union community to the increasingly organized laboring class. In his book on labor song-poems, Halker explains that, by the time of the publication of the relatively widely-available American Federalist in 1903, published union poetry was on the decline in terms of diversity of authorship. Though it picked up again with the popularity of IWW song-poems, this publication is an example of the end of an era of poem publishing in union newspapers and magazines. Unlike the Locomotive Firemen’s Magazine, the American Federalist covered many workers of many different professions. As such the poems were less personal, though no less passionate. 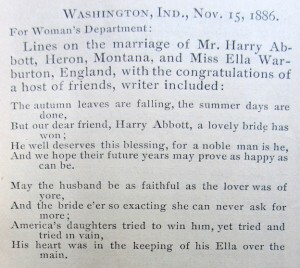 At this later date, it was more common for the American Federalist to reprint poems from other publications or writers. Poem; The American Federationist; January, 1903; Tamiment Library/Robert F. Wagner Labor Archives, New York University. 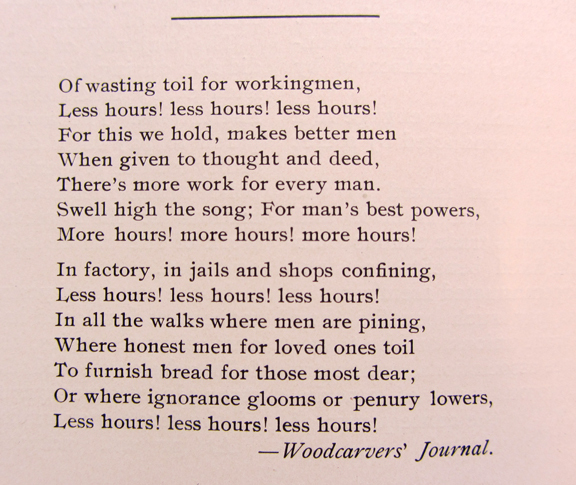 This short poem embodies the timely cry for an eight hour workday. Like the previous poems, it follows a typical rhyme scheme and with the repetitions of “more hours!” and “less hours!”, it is not difficult to imagine this as a song or chant at a rally. Another theme that carried through to this period was that of brotherhood. This language of kinship served to further bind union members together in duty, trust, and family. The Third Great Awakening, a religious trend that swept across America and brought tent revivals, renewed evangelism, and the YMCA, explains the seemingly seamless religious undertones in union poetry. It was not uncommon for union members to be religious, and the poetry in newspapers and magazines reflects the easy enmeshment of faith, family, and labor in union poetry of the Gilded Age. MY FATHER AND I WERE MEMBERS OF DISTRICT 65 WHICH IN THE LATE 1980’S JOINED THE UAW. WOULD YOU HAVE ANY WRITTEN WORKS ON THIS UNION? How important was Michael McGovern, The Puddler Poet, in this Gilded Age?